There are some owners who like to stay especially active on board, even bringing their favourite sporting equipment along with them. These are the high-scorers for yachts with the best sports facilities... It's not everyday that a yacht's brief is centred around sports, and especially tennis. But on 98.4 metre Aviva, one of the largest yachts in the world, this was a goal from the outset. “Build a big yacht around a padel tennis court was the main brief, I guess,” says the yard’s project manager Andreas Hering, with admirable understatement. “In three years.” This sports court is at the centre of Aviva, literally and figuratively. 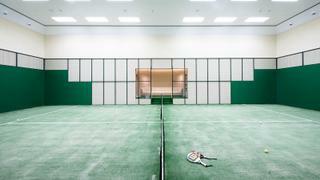 The hybrid squash/tennis court is part of the owner's daily routine, who had before limited his travels to places where there was a court on shore. Now he can take his workout of choice everywhere he goes. It's not everyday that a yacht's brief is centred around sports, and especially tennis. But on 98.4 metre Aviva, one of the largest yachts in the world, this was a goal from the outset. This sports court is at the centre of Aviva, literally and figuratively. The hybrid squash/tennis court is part of the owner's daily routine, who had before limited his travels to places where there was a court on shore. Now he can take his workout of choice everywhere he goes. The 70 metre Feadship superyacht Joy features a deck that's wide enough to enjoy a tandem jog around. This yacht is all about the exterior living, which includes making use of these ample decks with some great sporting facilities. A basketball and badminton court is set all the way forward on the owner's deck. This is complemented by her large gym and dedicated spa. All of this adds up to make Joy, which is available for charter, an ideal choice for those interested in a yacht with ample fitness, wellness and sporting amenities. The 70 metre Feadship superyacht Joy features a deck that's wide enough to enjoy a tandem jog around. This yacht is all about the exterior living, which includes making use of these ample decks with some great sporting facilities. 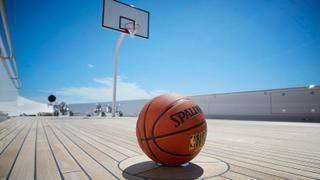 A basketball and badminton court is set all the way forward on the owner's deck. This is complemented by her large gym and dedicated spa. All of this adds up to make Joy, which is available for charter, an ideal choice for those interested in a yacht with ample fitness, wellness and sporting amenities. When inclement weather or a quayside location doesn't allow for a swim in the sea, then it's great to have a yacht with a lap pool. Heesen Yachts’ 70 metre flagship superyacht Galactica Super Nova has an infinity pool with a grand waterfall that is not only pretty to look at, but is sporting good fun. The jet stream pool provides a counter-current for those who want to swim laps, so the swimmers on board can stay in shape no matter what. When inclement weather or a quayside location doesn't allow for a swim in the sea, then it's great to have a yacht with a lap pool. Heesen Yachts’ 70 metre flagship superyacht Galactica Super Nova has an infinity pool with a grand waterfall that is not only pretty to look at, but is sporting good fun. The jet stream pool provides a counter-current for those who want to swim laps, so the swimmers on board can stay in shape no matter what. Hampshire II's foredeck boasts a multi-functional sports area. This space can be used for a variety of sports to meet her owner's desires, morphing from tennis courts to badminton or basketball to football. Not to mention, the 78 metre Feadship motor yacht can also clear "the field" and then this space becomes a helipad. An ingenious use of space all around. Hampshire II's foredeck boasts a multi-functional sports area. This space can be used for a variety of sports to meet her owner's desires, morphing from tennis courts to badminton or basketball to football. Not to mention, the 78 metre Feadship motor yacht can also clear "the field" and then this space becomes a helipad. An ingenious use of space all around. 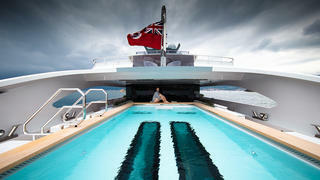 The entire stern of 96 metre Blohm+Voss superyacht Palladium is a fixed swim platform and sports area. This allows her exercise-obsessed owner, who reportedly trains up to five hours per day, a dedicated space to workout that is still accessible to the sea and fresh air. The large tender garage also stows plenty of toys for watersports, such as 14 Jet Skis and 11 windsurfers. This is a boat you won't simply sit around on. 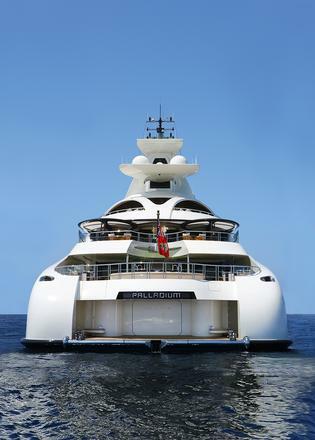 The entire stern of 96 metre Blohm+Voss superyacht Palladium is a fixed swim platform and sports area. This allows her exercise-obsessed owner, who reportedly trains up to five hours per day, a dedicated space to workout that is still accessible to the sea and fresh air. The large tender garage also stows plenty of toys for watersports, such as 14 Jet Skis and 11 windsurfers. This is a boat you won't simply sit around on. The owner's of Benetti superyacht Iron Man made an interesting choice with the layout of this yacht. Instead of the master suite being situated on the main deck of the master suite, as is the norm, it's the gym that takes pride of place in this location. 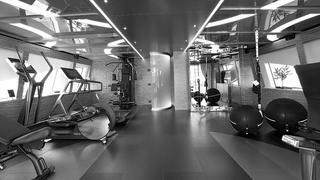 The family is said to make working out together part of their morning routine, and as such needed a large enough gym to suit. This gym offers exceptional views looking out over the water from the exercise equipment, and plenty of floor space for yoga, conditioning exercises or weights. The master suite is instead located full-beam amidships, which is a comfortable spot to sleep in any sea state, so this sporting amenity gets a win-win all around. The owner's of Benetti superyacht Iron Man made an interesting choice with the layout of this yacht. Instead of the master suite being situated on the main deck of the master suite, as is the norm, it's the gym that takes pride of place in this location. The family is said to make working out together part of their morning routine, and as such needed a large enough gym to suit. This gym offers exceptional views looking out over the water from the exercise equipment, and plenty of floor space for yoga, conditioning exercises or weights. The master suite is instead located full-beam amidships, which is a comfortable spot to sleep in any sea state, so this sporting amenity gets a win-win all around.